With Far Cry 5 which will be launched in early 2018, the developer Ubisoft Montreal is building a game which is more modern and provocative than any other title in the series before it. The story takes place in the state of Montana and it tells a story about the Armageddon of a militaristic world which is run by a pious priest. After he takes the rural community over and starts making preparation for the end of the world, you play the role of a young sheriff and get ready to arrest him. There are some new different places here in comparison with the previous Far Cry games: for the first time in the history of the series, the enemies in front of you are American citizens. Montana seems like a comparatively mild location for a game in the Far Cry series, compared to the various fictional scenes from Tibet to prehistoric times in the previous series. The idea was first proposed in 2013, and since then, the team has spent a lot of time and money trying to map out the exact picture of the region. Designers and artists have traveled to the state for many times to take pictures, bring them back to the studio, interview local people and learn how they speak, think and live. They believe that this kind of research was necessary so that the game will be novel and “doesn’t end up being a cliche”. One of the problems with creating a game which tells a potentially divisive story is that blockbuster titles take many years to complete and cost millions of dollars to produce. In order to recoup those costs, developers need to attract as many audiences as possible. That is why you so rarely see big-budget games taking a tough political stance. The series has long revolved around a concept known as “golden path,” a kind of ideal that leads you from the beginning of the story to the end. You can stray away from it and have some fun, but in order to progress you need to return. Far Cry 5 does away with that altogether. As soon as players have completed the opening sequence, they are free to follow whatever path they choose. 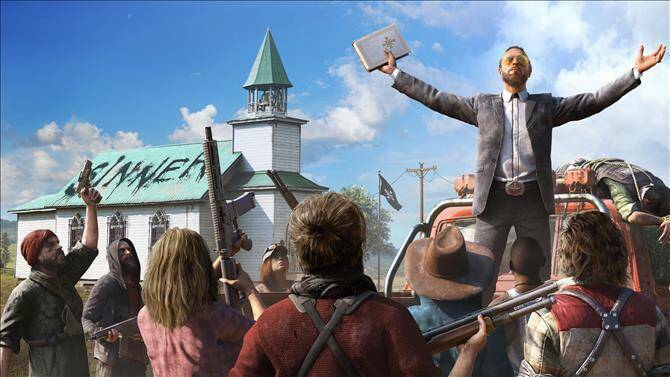 Players are all looking forward to the game eagerly, with all those efforts and unique features, you can wait and see if Far Cry5 can tell a good story and surprise you.